Early Wednesday morning on October 8, the full moon will become engulfed in darkness and cast a blood-red glow across night. And though this kind of thing was a little scary to many cultures in the past, today a total lunar eclipse is something simply to be enjoyed. Each month when the moon passes through its full phase, reaching the point in its orbit around Earth where it is opposite in the sky from the sun, it comes close to the shadow the Earth casts into space, usually passing just above or below it. But on rarer occasion, such as the full moon of October 8, 2014, the sun, Earth and moon will come into alignment and the moon will pass through Earth's shadow. The entire event, from the time the moon first touches the partial shadow of the Earth called the penumbra (literally "almost shadow") to when it finally departs once again, will take place over a little more than five hours, starting at 1:15 AM PDT and ending around 6:30 AM, as twilight begins to grow. If you want to experience the entire event then set your alarm for around 1:00 AM and find a comfortable place with a sweeping view of the southern sky and the full moon. Then, watch. Be advised, however, that you may not notice anything unusual at first, and even when you do eventually convince yourself of a slight graying on the left edge of the moon's disk, the change is subtle. The moon has touched the Earth's penumbral shadow, where the Earth blocks some, but not all, of the sun's light. Die-hard eclipse watchers may choose the five-hour option, but if you'd like to concentrate your viewing enjoyment to a shorter span of time, start watching closer to 2:15 AM. At this time the moon begins to enter the Earth's umbra, or full shadow where all of the sun's light is blocked, and you will see a very noticeable bite taken out of the left edge of the Moon. For the next hour and ten minutes the umbral shadow will spread across the Moon's disk, until at 3:25 the eclipse enters totality, when the Moon is completely engulfed in the darkest central core of Earth's shadow. 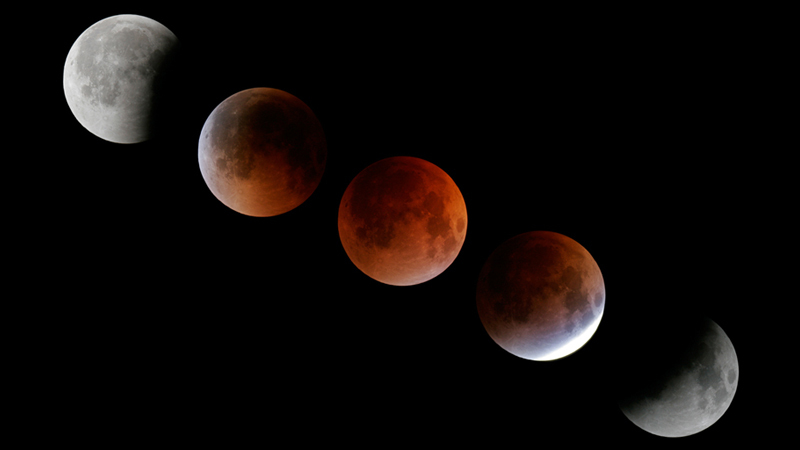 Totality, frankly, is the best and most beautiful part of a total lunar eclipse, so if all you want is a quick glimpse of the eclipse at its peak, check it out sometime between 3:35 to 4:24 AM PDT. Mid-eclipse, when the moon is deepest in Earth's umbra, will be at 3:54 AM. All things being equal the moon should completely vanish into the darkness of Earth's umbra during totality, but this is not the case. Instead, though the full moon does darken considerably, its light doesn't completely go out, and can change hue as well, going from the stark white of a normal full moon to orange or orange-red. This ruddy glow comes from Earth's atmosphere, which filters out the bluer wavelengths of sunlight to let the redder tones pass through. Our atmosphere also bends the sunlight, focusing it into the Earth's shadow and illuminating the darkness with reddish light. During a total lunar eclipse, if you were on the moon looking back at Earth you would see the dark disk of Earth's night side set within a fiery ring of red light—the combined glow of all the sunrises and sunsets all the way around the rim of the world.